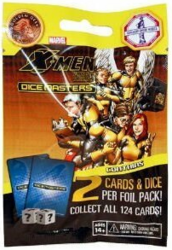 X-Men The beginning, a new wave for Marvel Dice Masters, the game of Mike Elliott and Eric M. Lang. This time we dive into the great history of the X-Men, from the first team formed by Professor Xavier (in 1963) to the contemporary series of What If? From superheroes to super villains, from Professor Xavier's school to the Brotherhood of Bad Mutants, there are 30 new characters in this wave.